Reheating bread in the microwave can cause dry unappetizing results. It is, however, very easy to keep your bread products moist. Water or damp paper towels are the key. 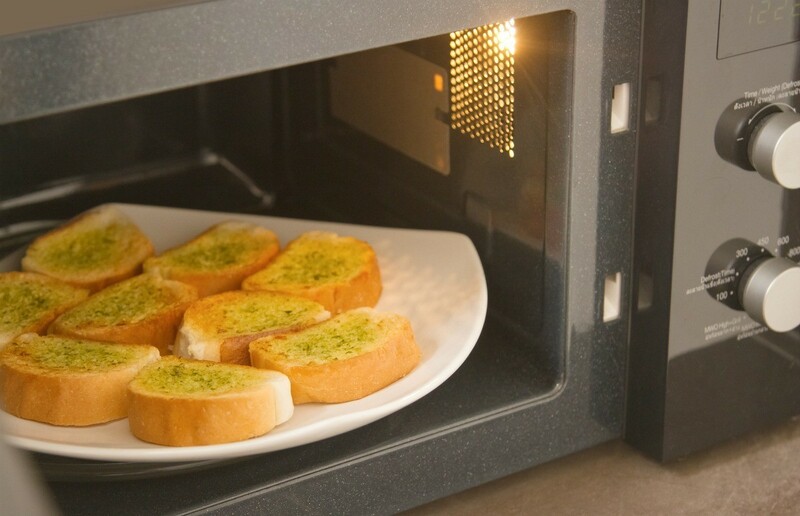 This is a guide about reheating bread in the microwave. When reheating bread that has been refrigerated, put in the microwave with a cup of water. It saves pizza, pancakes, muffins and bread from getting dried out or rubbery. Experiment. Start with 10 sec. and test it and then increase in 5-10 sec as necessary, until you find the ideal time for the future. I freeze my bread, bagels, hamburger buns, etc., and thaw them in the microwave for up to 30 secs for some. Instead of putting water in the microwave to reheat bread type products, I just wrap in a paper towel and microwave 10 to 30 sec. depending on the size, and if it is just cold or frozen. I like bagels and usually get quite a few, which used to always dry out before I finished them.So now I take most of them - cut in half - spread with cream cheese. I then cut in fourths, wrap in paper towels, put in doubled bread wrappers or ziplock bags, and freeze. Then I microwave as I want them. Guess what? they taste just like new. Another way to bring them back to original state is to moisten a paper towel and wrap the bread or muffin, etc. in it. Nuke it for 10-15 seconds and you are all set.